Ingredients: 100% Pure Moroccan Argan (Argania spinosa) Oil. Fall is here in full spring with the most stunning colours around us. We love Fall for all things pumpkin, lattes and warm clothes. However, it’s also that time of the year when your skin needs that extra moisturising boost. For this, what is better than the age-old magical Argan oil formula! We all know Argan oil and its benefits, but not all products in the market gives you the same results. Reason? - The number of other ingredients added to argan oil. If you are like me and love your Argan in its purest form, then you must try this product. Yes, the only ingredient in this bottle of Maple Holistics is pure Moroccan Argan! I bought this product 3 weeks ago and have been using it consistently since then. This is a multipurpose product and can be used for your skin, nails and hair! Usually, I put few drops of this oil on my damp hair and it has definitely made my hair silky smooth and hydrated. Make sure you spread the oil evenly throughout your hair to get the desired results. I have also been using this product on one of my cracked nails and it seems to be working wonders for me! My nail is in much better shape than ever before. Though it will not fix your cracked nail, but it will surely help heal! My skin is also very prone to getting super dry in fall and winters. So, I decided to try using tiny drops of Argan Oil on my hands and feet. Results? - I am so happy I did that! It has reduced free-radical skin damage so drastically. All in all, I think this is a must have Multi-Purpose Fall product that you just can’t afford to miss. 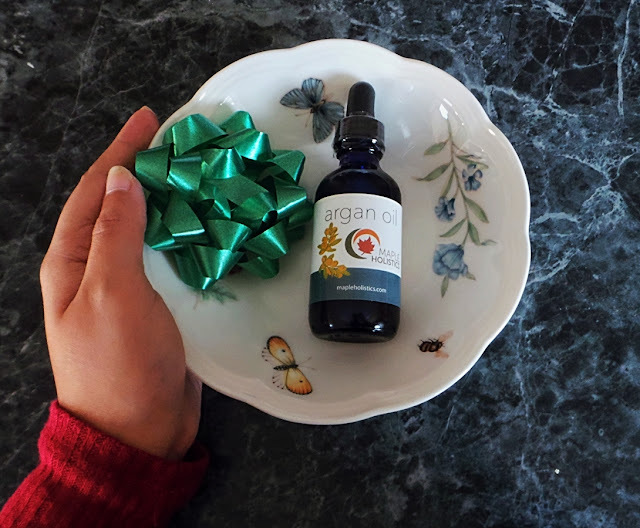 What con can you find in a great quality Argan oil? I am planning to do a giveaway! All you have to do is post in a comment why would you like to win this? I will announce the winner on November 3rd, 2017 All the best lovelies!! I could sure use some of this for my cracked yukky feet right about now. I hope I win! ohh i need to try this! I could totally use it for my feet and a little nick recovering on my hand! I need to try this! I teach Kindergarten so I am constantly washing my hands and my skin gets so dry. I would use on feet for winter!